When Charles Bey and his wife Carlotta (who live in the Euclid suburb of Cleveland Ohio) were approved by their doctor for a VA grant (Veterans Administration) for a roll in shower they could not have been happier. Since Charles had his foot amputated and was fitted with a prosthetic the ability to maneuver around their 5’ x 7’ bathroom and climb over a high bathtub rail to shower was not easy. Learn below how Charles and Carlotta with the help of Cleveland Design & Remodeling and The Bath Doctor (divisions of Innovate Building Solutions) updated this bath to improve function, reduce maintenance and add long lasting style. A tub that needed to be converted into a roll in shower – For Charles to climb into this tub was a dangerous proposition. A barrier free shower could provide a safe (and modern looking) space for anyone using the bathroom. The door to enter the room was too small – The entry was increased to 32” to accommodate a small wheelchair. It would have been preferable to open this space to 36” but due to some structural challenges this was not possible for this project. 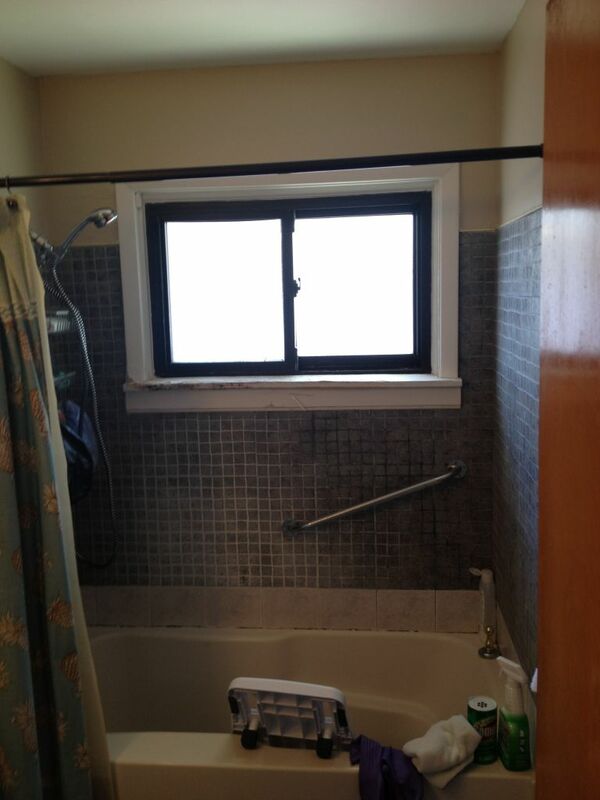 Outdated, moldy and poor functioning bath products – Carlotta did not like the look of the old style black and white tiles floor and the old sliding shower window did not operate well and it rested on a deteriorated and moldy wooden sill. AKW zero threshold shower base – Using a glass reinforced plastic base (the same product that is used in aircrafts) that is installed onto the studs the Bey’s bathroom became one continuous barrier free wet room. Almond white acrylic stone pattern shower wall surrounds – Acrylic was chosen both for it’s looks and low maintenance benefits. 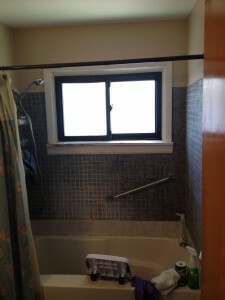 Glass block shower window with an acrylic trim kit – The nasty and moldy wood sill are no more! The Bey’s now have a no maintenance glass block window which is finished off on the inside with an acrylic window trim kit. Elongated comfort height toilet – A taller toilet was chosen to make it easier to sit down on and get up from. 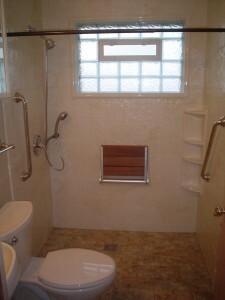 Teak fold down seat with 24” Moen grab bars– In this project safety and style did not need to be mutually exclusive. Nicer looking decorative grab bars where chosen and a teak fold down seat saves space and looks nice. What do you think about Charles and Carlotta’s project? Do you need any help or feedback for a similar project? Please comment below. For additional help with a roll in barrier free shower or assistance with getting a home improvement grant through the VA please call Cleveland Design & Remodeling (216-658-1270) or The Bath Doctor of Columbus (614-252-7294) and Cleveland (216-531-6085. 5 ½ Little Known Secrets to Design a Handicap Accessible Shower Which Doesn’t Look Ugly!